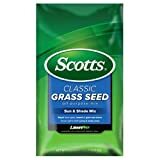 Classic sun and shade mix seed grows well in sunny and shady areas and is used for repairing bare spots, reseeding or new lawns. 99.9 Percent weed-free and uncoated for greater seed coverage. Builds a lush, dense durable lawn. This 3-pound bag covers approximately 2400 square feet.